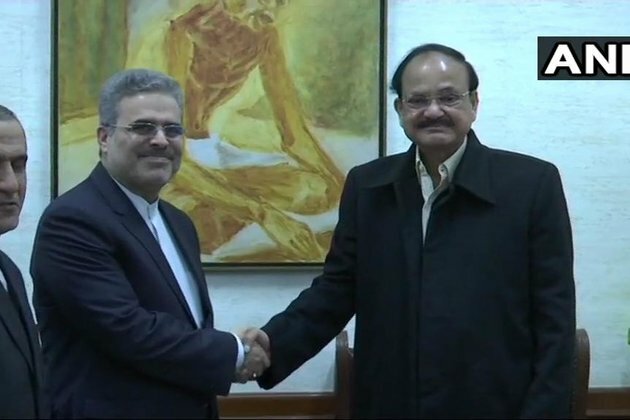 New Delhi [India] Feb 19: Iran Ambassador to India Ali Chegani met Vice President M Venkaiah Naidu here on Monday and discussed bilateral ties and international terrorism. "The Ambassador of the Islamic Republic of Iran to India, Dr Ali Chegeni, calling on me, in New Delhi today. We have discussed several issues including international terrorism, economic connectivity and people to people exchanges," said Naidu on his official twitter account. The meeting could be a part of coercive diplomacy by the two countries who recently suffered ghastly terror attack on their respective security forces. On February 13, a total of 27 members of Revolutionary Guard Corps were killed after an explosive-laden vehicle targetted the bus which was ferrying the military personnel in Khash-Zahedan sector of Sistan-Baluchistan province in south-eastern Iran. The bombing also injured 17 others. According to Iranian media, Jaish-al-Adl, a separatist militant group claimed responsibility for the deadly assault. On February 14, around 40 CRPF personnel were killed in Jammu and Kashmir's Pulwama district in an attack orchestrated by Pakistan-backed Jaish-e-Mohammed (JeM) outfit. The convoy comprised of 78 buses in which around 2,500 personnel were travelling from Jammu to Srinagar.